The following are excerpts from notes taken by Oronoque Westland (SL) and Ellie Brewster (SL) during the AAUW talk by Sarah Stewart (SL: Petal Stransky) on June 4, 2012. This is not a transcript of the entire talk, but it covers the main points, and it has been reviewed for errors by the speaker. Sarah then led us on a tour of the SLENZ Project, modeled on a midwifery unit designed by Professor Ian Forbes, University of Technology, Sydney. The instructional design for this project was provided by Sarah Stewart, Leigh Blackall, Clare Atkins, Todd Cochrane, Aaron Griffiths, Sakura Schlegal (SL) and Rusalka Writer (SL). Ellie Brewster (SL): Welcome to the Ohio State University virtual campus for the Department of Women’s, Gender and Sexuality Studies. We teach classes here, and our sim is open to the public. If you walk around, you’ll find quite a few student presentations, and other course materials. We also have an art exhibit on the other side of the island, “Lightbird,” by Maya Paris (SL) which makes light-hearted references to reproduction. This exhibit is open to the public. I’d like to begin by thanking the American Association of University Women, which has been a generous sponsor of our work here on the island over the past two years. 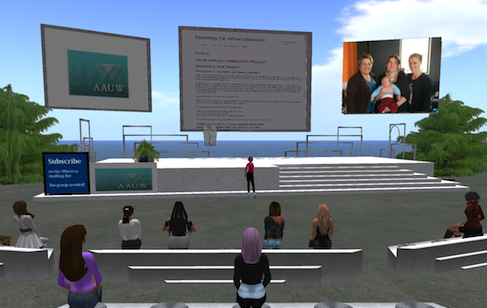 The AAUW Virtual Community series was created to encourage the interest of women and girls in technology, and we have had a wide variety of subjects at these talks; our last speaker, Nany Kayo (SL), spoke on violence in Native American communities. Today, Sarah Stewart (SL: Petal Stransky) will be presenting on her work as a midwife in New Zealand, and her experience using the SLENZ build in Second Life. * The SLENZ project is widely known, and in fact, the video that was made about The Birth Place has received nearly 900,000 hits on You Tube! We’ll have questions and answers after the talk, then proceed to the SLENZ midwifery build for a tour. If you are new to SL, and would like a little help, please let me know. Petal Stransky (SL): Thank you, Ellie, I’m very glad to be here. Today I’d like to talk about my work as a midwife in New Zealand, as well as my experience teaching midwife trainees in Second Life. I’d also like to talk about the sustainability of the SLENZ birthing unit in SL. I’ll start with this picture behind me, in which I am standing to the left of one of my home-delivery clients. The other woman assisted as a midwife. Everything in this birth was straight forward, although the baby did hae an infection later on that had nothing to do with the home birth. Everything is fine now. As a midwife, I have a great deal of autonomy. I can organize an ultrasound, blood tests, and I can refer the mother to other health professionals. If she develops pregnancy diabetes, for example, or if there are concerns over the baby’s health, I can refer her to a pediatrician The woman has the right to birth her baby wherever she wishes. In some cities there isn’t a birthing unit; the choices are home or hospital. so some women’s choices will be dictated by what’s available. I am at home with the mother or if she goes into hospital, I can go into hospital with her. When the baby is at home I can visit her every day for the first few days, then as she becomes more confident, I’m required less and less. By the time the baby is about three weeks old, I’m visiting weekly, spending more time if she is breastfeeding, less if she is bottlefeeding . The antenatal period follows the traditional pattern, similar to what you would see in America. The care is very dependent on the individual; it’s important to get to know the woman, her home, and know what resources she has available. I meet her family, in order to understand any problems she faces with resources. Some families are rural, maybe 1 1/2 hrs away, and sometimes they come into town to meet me, often on shopping trips, or while visiting. For post-natal visits, I often go to them. When everything progresses normally, she may see no other health professional than me. If there are issues of labour and birth, or if the baby is born with complications, I will refer mother or baby to the appropriate health professional. If we’re working at home, I have a backup midwife working with me; if we’re in hospital, I have hospital backup. Some of the smaller towns in NZ have smaller hospitals, and some women in rural areas will have to transfer to larger towns if they wish to use hospitals. You don’t have to be a nurse to be a midwife, most go directly into midwifery education, although if you want to be a nurse-midwife, six years of education is required. The midwife goes into a bachelor midwifery degree, a three-year program offered at a polytechnic or university. We have four institutions that offer midwifery degrees (New Zealand has a much smaller population). Many of the older midwives don’t have the academic background that the younger women have. One of the problems we have in education is having access to clinical experience, and this is a problem elsewhere, too. It’s a very hands-on profession, students need practical experience; they must catch a certain number of babies, and do a given number of antenatal examinations. We have a growing rate of medicalization in New Zealand, a growing caesarean rate, which is now at 23-25 percent. Midwives deal with normal birth, but we are finding the rates of normal birth are decreasing, because of the increasing medicalization of pregnancy. Question from audience: Every time there are complications are the women sent to hospitals? What complications are handled by midwives? That depends on the level of complication. If you have a woman, for example , who has gestational diabetes, it may be that she is overseen by an obstetrician, but I handle her care, and I collaborate with the obstetrician in her care. However, if she develops pre-eclampsia (toxemia), this is a life-threatening condition. I will remain involved as a support person, but I can’t provide constant monitoring, and I therefore hand over to the hospital midwife, who is skilled in high-level care. There are two kinds of midwives in New Zealand. Fifty percent work in health facilities; they work in shifts and run the birth units in the hospitals. As an LMC (Lead Maternity Carer) I come in with the woman first, but then I will visit other clients. Generally, women who work in the hospitals prefer to work shifts. An LMC has to be on call; if you attend a caesarean you stay in hospital, but when you go home your LMC visits you at home. 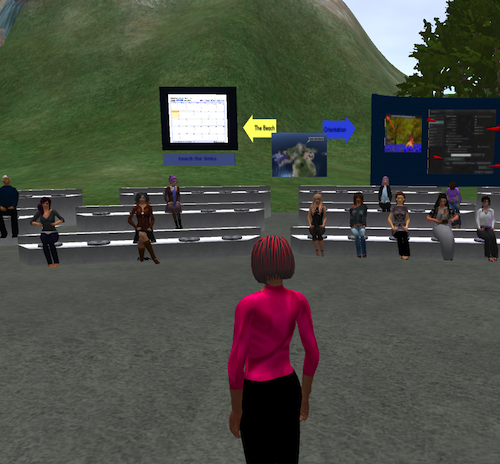 Question from audience: how do you use Second Life in midwifery education? Our problems with the education of midwifery students involves providing an experience of normal midwifery, without too much involvement with the hospital. Students need the opportunity to see women in their home environments. The SLENZ project was set up through government funding; half a million dollars was granted to set up two projects in SL, one prepared students for midwifery practice, and the other was our virtual midwifery build. We set up a virtual birthing unit, and our aim was twofold: we wanted to provide an environment where junior students in particular could get an idea of what a normal birth was like, and learn how to do interviews, assess women, and get an idea of how environments affect outcomes for women in labour. Highly clinical atmospheres cause tensions, and women are less likely to birth normally. A more warm and familiar atmosphere is conducive to a normal birth. We established a simulation involving one role-playing birthing mother and one role-playig midwife. The woman’s birth is divided into five segments, from labour to post birth; it isn’t a fancy simulation, there’s not a lot of bells and whistles, we wanted to concentrate on getting the student to think about how she communicated with the woman, and how she responded to what was going on. Students still had to have clinical experience, but it gave them another place to practice, a place where it was safe to make mistakes. The student can simply restart if there’s a problem: you can’t do that in real life. We role-play talking to the woman on the phone; students don’t often get the opportunity to de-stress a woman over telephone, and asses their care needs. We were surprised by what we learned using the virtual birthing unit. We had expected that the more experienced students would use it as a revision, but what we found in practice was that it was the very junior students who really loved it. Seniors presented the theory as they used the build, but it was really the juniors who went in. We didn’t really design it for them, but they went in and problem solved things for themselves, they used it as an orientation to the birthing environment, and also to their role as a student. When they went into clinical practice, they were better prepared. Question from audience: Who is using the virtual birthing unit now? The outcome of the project was unfortunately that the birthing unit hasn’t been taken up in New Zealand. There was a lot of interest and enthusiasm about the project, but once it ended, the schools didn’t take the birthing unit up, that was because they felt the technology was too complicated, and too time consuming. They felt it took too much time to orientate students and lecturers. Very sad, but he good thing is that we created the virtual birthing unit with a creative commons license, and anyone can take the lesson plans, materials, and copy for use anywhere in the world. A nursing educator in the U.S. has used it to teach students about caring for the elderly, and Colleen McCants, Fay Cross and Jenny Bailey have used some of our ideas for The University of Nottingham’s virtual midwifery unit; this year their project won the Philips Avent Award for Innovation in Midwifery. Updates on their project are here. Hopefully, as people come to know about the advantages of modeling the birth experience, more programs will be developed around the SLENZ build. The problems in adoption got us thinking about the sustainability of these initiatives. You do need a level of expertise to work in virtual worlds, and trying to take a project forward with a group who have limited skills and time requires careful thought. Although I say we had a grant for this project, we kept it reasonably simple. We didn’t want to go into the technical details too much, we wanted to give the students communication and assessment skills. Ellie Brewster: I’m wondering if you could talk a little more about the interplay of technology and learning. I’m finding that in my classes, once the student learns to move about, we don’t need complicated setups for learning. What you seem to be saying is that it’s the social aspect of virtual worlds that is important for your teaching, and that the most important aspect of the virtual environment is just the environment itself. I agree. I have already mentioned the telephone scenario which is very simple technology, but it has been incredibly powerful learning for students. This is great news for teachers who cannot afford to buy their own islands, or make complex builds. 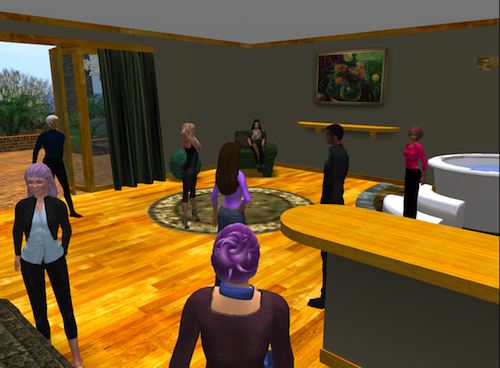 My advice is to look around Second Life, see what you can find and then use your imagination to devise learning activities that incorporate what is already available. Ellie Brewster: Thank you so much, Sarah. I know we’re all keen to see the SLENZ build, so if everyone would use the link Sarah has provided, we can continue our meeting there.